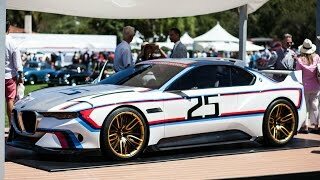 At the Concorso d'Eleganza Villa d’Este BMW unveiled the BMW 3.0 CSL Hommage R 2015. It’s a concept car prepared to celebrate the 3.0 CSL. This isn’t the first time that BMW is preparing a model to pay tribute to its previous successful models, prior to this thy introduced M1 Hommage, which paid tribute to the iconic M1. 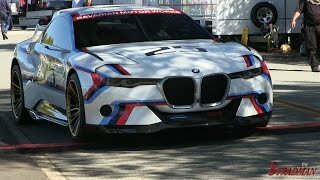 Let us have a look at the review of BMW 3.0 CSL Hommage R 2015 to know BMW’s way of celebrating. Interior of BMW 3.0 CSL Hommage R 2015 is impeccable amalgamation of racing components and those borrowed from the original CSL. You’ll find the interior all drenched and soaked in carbon-fiber-reinforced-plastic with dashboard marking presence with wooden works. The essence of same wood further marks its entity all across the cabin while the instrument cluster this time gets a new design. The design for this model will somewhere take you to legendary model, as the instrument cluster features only speed, revs, shift point and current gear info. As we mentioned a little earlier that the essence of original CSL gets the blend of race-specs, interior of BMW 3.0 CSL Hommage R 2015 gets a pair of bucket seats in cabin, essence with bright-yellow accents. Talking about safety seats are integrated with six-point harnesses while the transmission tunnel incorporates two helmets in it. Adding to the looks of this remarkable model, you’ll notice DTM-style pull straps working as openers on door panels while reflector technology has been integrated with LED strips for eBoost energy accumulators, creating 3D effect on the covers. 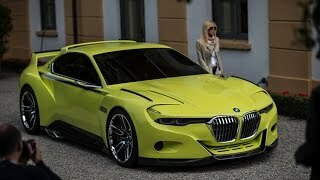 Exterior of BMW 3.0 CSL Hommage R 2015 portrays the dedication of team while creating this model. There are a lot of similarities that the team has brought into this model when compared to original CSL. This includes the roof spoiler, rear fenders and rear wing. The same essence also splatters its aroma through the taillights. With these looks borrowed from the legend being accompanied by the beltline stripe and BMW badge on C pillar the rear end looks truly aspiring. Moving ahead to the front end, we didn’t noticed much of resemblance from the original model, however the changes here includes a kidney grille sitting between elongated headlamps with laser light and LED technology. We personally didn’t like the amalgamation of kidney grille and the farewell to legendary round headlamps. 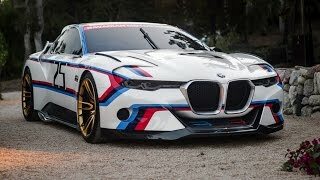 Not only this company has also bid goodbye to the bumper and now the exterior of BMW 3.0 CSL Hommage R 2015 comes integrated with bumper incorporating fender flares marching their way to center piece which has large splitter, splattering aggression. 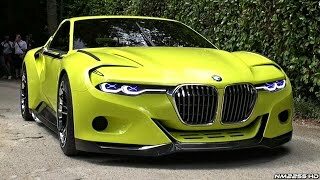 Rounding up the entire exterior details we would say model is good with its overall integrations; however the best here we would say is the Golf Yellow color soaking the entire exterior of BMW 3.0 CSL Hommage R 2015, paying tribute to the 3.0 CSL. The BMW 3.0 CSL Hommage R 2015 brings a six-cylinder in-line engine with eBoost, beneath its hood. Though not much has been shared regarding the engine details but with this we can easily presume the engine to offer Hybrid drivetrain. Also we can expect the displacement to be 3.0 Liter generating throbbing output to complement its looks. However nothing can be assured as of now, all we can do is wait till the time company unveils total details about the engine of BMW 3.0 CSL Hommage R 2015.